Apple Park is powered in part by a 17-megawatt rooftop solar installation. Apple has become the world’s first major tech company to be powered by 100% renewable energy. 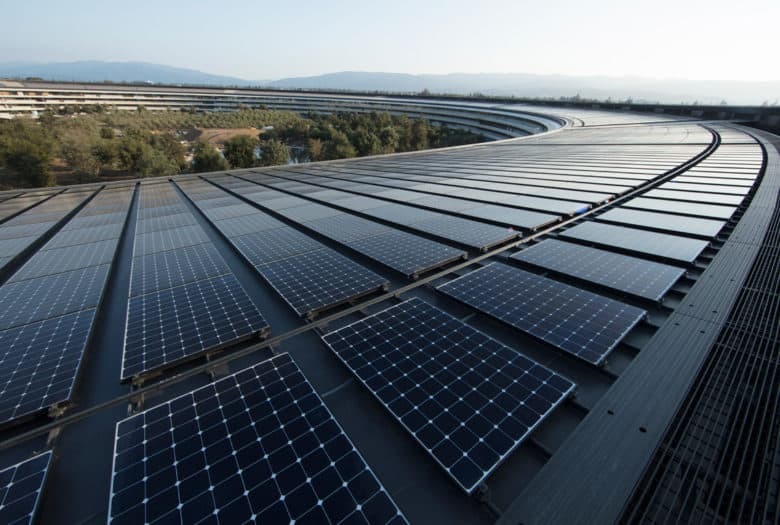 The company has been investing heavily in renewable energy sources for years, and in a statement today, Apple says it has already achieved its goal to use 100% clean energy to power all of its global facilities. Last year, 96% of Apple’s global operations were powered by renewable energy, but the company finally crossed the 100% threshold this year. The huge feat includes data centers, offices and retail stores in 43 countries. “We’re committed to leaving the world better than we found it. After years of hard work we’re proud to have reached this significant milestone,” said Tim Cook, in a press release. “We’re going to keep pushing the boundaries of what is possible with the materials in our products, the way we recycle them, our facilities and our work with suppliers to establish new creative and forward-looking sources of renewable energy because we know the future depends on it. Apple is also trying to get its manufacturing partners to use clean energy too. The company announced today that 9 more manufacturers nine have committed to make all Apple products with renewable energy. That brings the total commitments up to 23 companies. The company currently has 25 operational renewable energy projects with an additional 15 under construction. Once those projects are completed Apple will have access to 1.4 gigawatts of renewable energy generation across 11 countries.